Glacial plucking or quarrying describes a glacial erosion process where ice flowing over an obstructing landform causes fragmentation of rock on the lee side of the landform. Usually, plucking action is attributed to the movement of a warm based glacier. When the temperature at the ice-rock interface is exactly equal to the pressure melting temperature of ice, the increase in pressure when moving ice loads an obstructing surface can cause ice to melt. The resulting meltwater can drain through pores or joints in rock, eventually reaching the lee side of the obstruction. Reduced ice pressure on the lee side favors meltwater refreeze, whereupon accumulation or expansion of confined ice can act to induce tensile failure in the lee-side rock. The above-described model for plucking, the regelation model, breaks down when glacial ice is cold, that is, at a temperature below the pressure-melting point. Beneath a cold-based glacier, no liquid-phase water is available to drive a regelation process. Relict occurrences of severe glacial plucking can be observed on the Avalon Peninsula at several locations. Many of these occurrences appear incompatible with warm-based glacial flow and must therefore be attributed to the action of a cold-based glacier. If this attribution is valid, then determining a mechanism for the occurrence of cold-based plucking becomes a key requirement for interpreting the observations. When cold ice (moving only by creep) bears on an obstructing body of rock, the rock can fail solely as a result of mechanical loading. Hence, part of the process of cold-based plucking can consist of the widening of joints or the creation of faults entirely by mechanical action. On the lee side of an obstruction, where ice pressure is reduced, brittle failure of stressed rock can result in fragmentation. Glacial ice can move, by creep, into spaces between rock fragments and thereby separate the fragments. Such mechanical plucking undoubtedly plays a partial role in many instances of glacial plucking attributed to the flow of a cold based glacier. Mechanical action can play a similar role in plucking by a warm-based glacier. The main question to be considered now becomes: Does a cold-based analogue to the regelation process exist? Observations of the geometry of bedrock displacement at several sites on the Avalon Peninsula suggest that mechanical action is not the primary cause of occurrences of plucking by cold-based glacial ice. A cold-based analogue to the regelation process can be developed by assuming that "reverse ice segregation" can occur when cold ice bears against permeable bedrock. In "reverse ice segregation", the premelted ice at a pressurized boundary between crystalline ice and bedrock enters pore space in the bedrock. The process is driven by pressure at the ice-rock contact, but does not involve pressure melting. 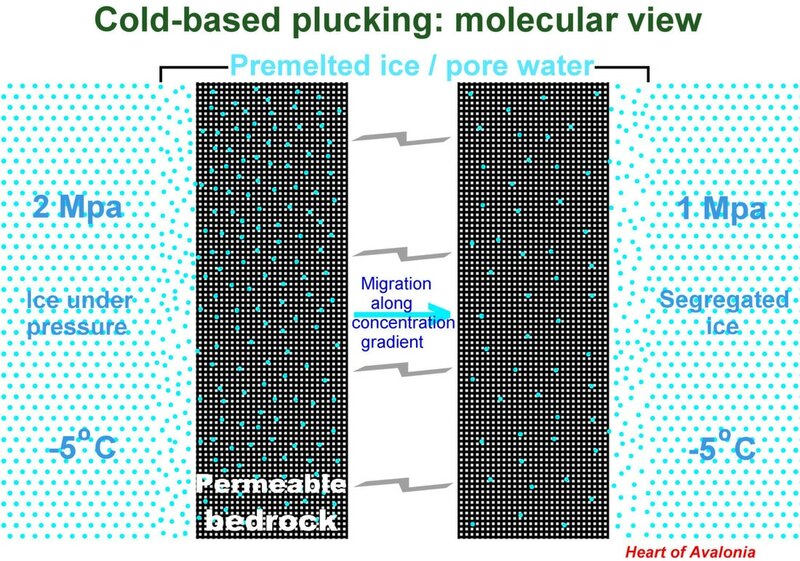 The process can thus occur at any temperature so long as water molecules entering pores remain sufficiently mobile to migrate into the rock and prevent buildup of equilibrium conditions at the ice-rock interface. Assume now that "reverse ice segregation" is accepted as a valid process. Then combining this process with a process for driving pore water through bedrock, and finishing with a conventional ice segregation process at a zone of reduced pressure (see Technical note 11), completes the analogue to regelation-driven warm based glacial plucking. The diagram below illustrates the cold-based plucking process at the molecular level. In the above diagram, the temperatures and pressures indicated are arbitrary and serve only to illustrate the general concept. Reverse ice segregation takes place at the ice-rock boundary on the left side of the diagram. The gap in the center represents an unknown thickness of intervening bedrock and it is unclear how rapidly the entire process would run, given a substantial thickness of rock. It should be noted that the process could run at a very low rate and still account for significant rock disruption over long enough time intervals. The model as described above makes no allowance for the heat transfer associated with moving water molecules from the crystalline environment to the pore environment and back to the crystalline environment. The required heat transfer is a function of the energy difference for a water molecule in an ice crystal versus a water molecule interacting with bedrock molecules in a pore space. This energy difference would depend, in part, on rock composition and pore geometry. If the energy difference were small, the overall process is then favored by the lack of a need to transfer large amounts of heat. However, a significant energy difference is a requirement for driving the mechanical action associated with ice segregation and bedrock shift. ​The diagram below shows the complete cold-based glacial plucking process. 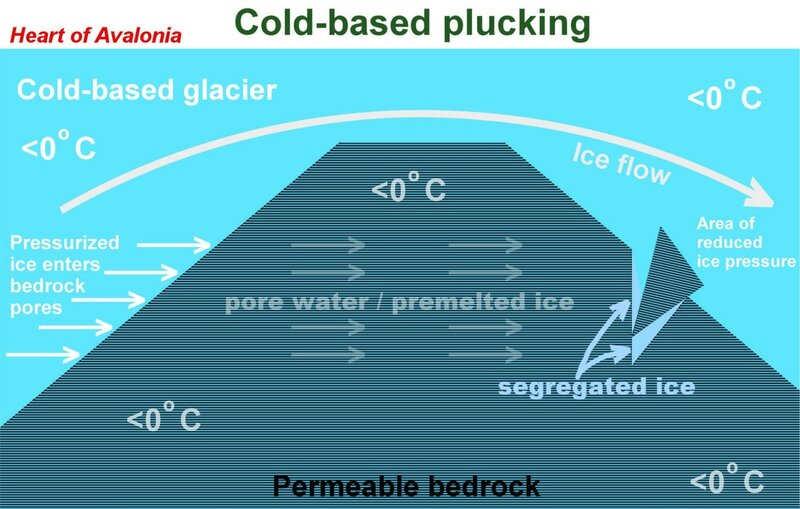 The cold based plucking process, as illustrated above, could explain observations where glacial ice appears to move through intact bedrock causing occurrences of plucking that are hard to explain by any other means. See Illustrative Feature 07 for examples.